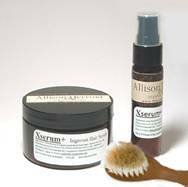 Products: Allison Herrold Organic Beauty Products are Natural and have No chemicals or preservatives added. All Natural and organic ingredient scrubs help to exfoliate and moisturize the skin leaving it looking and feeling wonderful. Custom blended natural oils, exfoliating sugars with natural Glycolic acid, Organic or Wild Crafted Essential Oils. No Chemical or Preservatives. All Natural Ingrown Hair Serum to help with ingrown hair and to maintain healthy skin. A soothing serum for daily use in those special areas. A Custom blend of moisturizing oils, essential oil and willow bark. A custom blend of oils, exfoliating sugars with natural Glycolic acid and essential oil. Helps to soften and straighten hair follicles while soothing and moisturizing the skin. Formulated not to clog pores or cause acne. Natural Bristle Wood Handle EXFOLIATING BRUSHES to Dry Brush AND/or Wet Brush your skin. On your next appointment do not forget to ask Allison about all of her products.